Scanned. 120 mm neg. Freshmen class officers stand outside of the bookstore. 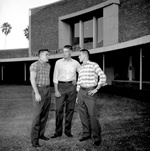 In 1958 UF Seminole Yearbook, p. 132. Photograph 3623 from the University Archives Photograph Collection.